Habitat volunteers take a huge part in the construction works, they are not only building homes, but also communities. Joe Cross, husband and father of two kids, and one of the most engaged expat volunteers in Hungary told us about his motivation in volunteering. Can you tell u s a few words about yourself? Sure! My family moved to Budapest in 2013 from San Diego, California. My wife is a talk therapist and works with overseas clients via Skype. My son is 10 and my daughter is 6. I do independent consulting with US companies. We lived in Prague years ago and visited Budapest many times. So when our children were old enough, we decided to move to Budapest so they could learn about different cultures. We love living in Budapest and plan to stay as long as we're permitted. In our free time, we enjoy geocaching and playing disc golf (frizbi). Did you do any volunteering before meeting us? I spend about 15 hours per week working with a group called e-NABLE. We use 3D printers to make prostheses for children. I started a local chapter in Budapest in 2014 and we've delivered around 15 devices in Hungary. I am also on the Board of Directors of Enable Outreach, a non-profit organization that helps e-NABLE chapters around the world. How did you find Habitat for Humanity Hungary? I have known about Habitat for Humanity for many years. It is well-known in the US and several of my friends have volunteered with Habitat. When we moved to Budapest, I found the local Habitat group online. When I emailed to ask about volunteering, Renata contacted me and invited me to participate. My first build day was in May 2015 in Kőbánya. I enjoyed it very much and asked to come back soon. Since then, I have participated in about 8 build days and last year's fundraising 10K (charity run). My wife has also joined about 4 build days. We look forward to helping out this year, as well. 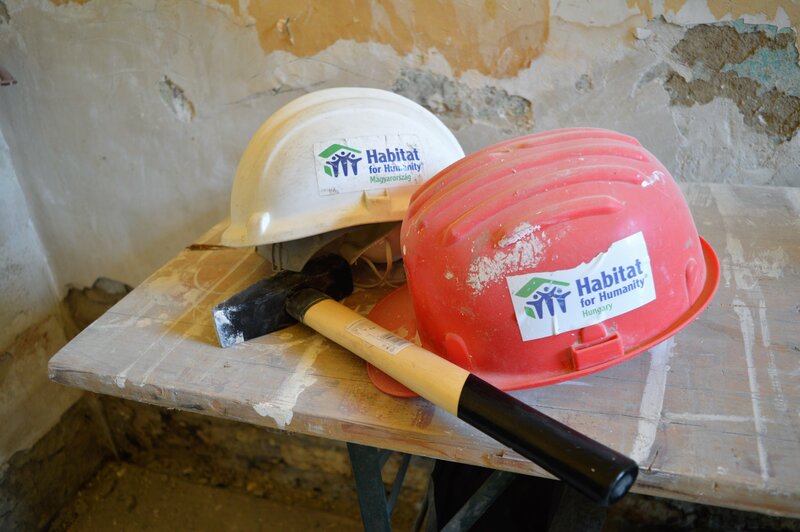 How come you chose Habitat Hungary for volunteering? I see many people camping in parks when I play frizbi (disc golf) around Budapest. I'm glad to help make sure there are flats available to everyone who needs one. What's your favourite story in connection with us? I remember when we worked on a couple’s. When we were done working, the wife spoke to all of the volunteers for a few minutes. I didn't understand everything she was saying in Hungarian, but I could tell from her voice and her face that she was truly grateful for everyone's help. It was a wonderful reminder how important Habitat for Humanity is to people and how it makes a real difference it our lives. But my most memorable moment was at last year's 10K event when we got to warm up with Krisztián Berki, an Olympic gymnastics champion. It was great to meet him in person. Do you have any message for those who have not worked with us before? Working with Habitat for Humanity is a fun, rewarding way to help your community and meet English-speakers with similar interests. You don't have to know how to do construction – just bring your energy. For example I brought my friend, Christian Brocard, to a build day last year and he wound up working on several flats after that. While my kids are too young to help with building, they are doing fundraising and running in this year's Vivicitta family event.